I typically think of Jason as the contrarian in the family. He’s insightful and he excels at communication – especially when it goes against the grain. 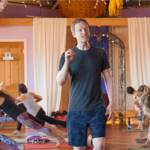 Last week, Jason wrote, In Praise of the Quiet Class, a piece that talks about how, contrary to modern yoga norms (yoga in music class), he’s never played music during yoga class in his 20 years as a teacher. And as I read it, I found that my own inner contrarian was rising up to meet his contrarian. So, I wanted to add my voice to the topic. You see, I truly enjoy and value taking yoga classes with music from time to time. So much so that I interviewed Stephanie Snyder for the podcast this week to talk about how she does it so skillfully. Stephanie talks thoughtfully about why she includes music in class: Chanting and playing music help facilitate rhythmic breathing. 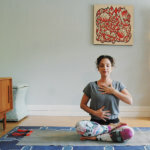 Music in yoga class can be a great bridge for folks who aren’t ready yet for complete silence. And it can evoke emotion that can draw people into themselves and into a more inquisitive, receptive state. You can hear her talk about all this more articulately than I on the podcast. But what drew me to stay up late on a Monday night writing this for all of you was the following little revelation that I can’t shake. I studied ballet through my whole childhood. By the time I was 12, I was dancing seven days a week and spending all day Saturday and Sunday training and rehearsing. When you take a ballet class, you begin with the technique at the barre. You meticulously warm up your feet, ankles, legs. Eventually, you move to the center of the room and continue honing your technique – pirouettes, arabesques, more tendus. You drill and repeat, drill and repeat. Then, at a certain point, you learn a piece of choreography and you DANCE. You let go of the inner critic that hounds you about your knock-knees or your pronated feet and you put all of the steps together and you express yourself through your body. It’s FUN and the music is beautiful and there’s a levity in the room that fuels everyone simultaneously. I also love classes with a good playlist because they allow me to drop my technique and just be in my body moving, breathing, and doing the yoga poses that I’ve drilled and repeated for the past 20 years. During certain times in my life or even certain times of day (like after a long day of work and commuting), I want to drop the technique and just dance. I want to forget about my fussy wrists and my crappy backbends and I want to move and breathe and express – even if, especially if nobody’s watching. Like Jason, I know there’s a place for both quiet and music-filled yoga classes. And if you only practice to music, I implore you to consider adding a few minutes of pranayama or meditation in silence to the beginning or end of your day or your practice session. But if you’ve never tried a yoga class to music? Or if you had a bad experience 10 years ago? It might be worth trying again. You might just unlock some moving, breathing, emotive part of you that’s not of the mind, but of the moment. Sounds like a great combo. Thanks, Melanie! So nice to continue to feel connected to you even though we’re so far away! A few weeks ago, I got to the studio early to do a self-practice (a rarity, given my living situation (4 other roommates) and my teaching schedule). I chose my favorite playlist, and started with child’s pose, sun salutations, warriors, balancing, and other typical vinyasa poses and transitions. At a certain point, one of my favorite songs came on, and I felt a sudden urge to leave the borders of my mat and start moving freely – literally to dance around the room. The urge came as a wave, and I quickly tried to quiet it, thinking, “I’ll just do another dancing warrior sequence – that will be enough.” Then the desire to dance surged again, and I thought, “What am I doing?! I have a whole studio to myself! I can play music as loudly as I want!! Just dance, already, Abby! !” So dance I did. I left my mat, leapt, twirled, jumped, cartwheeled, and moved in whatever way my body told me to. When that song ended, another began, and I kept dancing. This continued for 3 or 4 more songs, until I was tired enough to want to take a child’s pose again. And when I did, I cried – I have no idea why, and I don’t especially care; it was what I needed, so I followed it. Andrea! I love your podcast! You always have interesting guests, and ask all the good and right questions. I would love to leave a review, but I don’t use iTunes (I use Podcast addict-app), and don’t have an Apple account. Is it still possible to leave a review?